After our successful and very social time in Yorkshire we headed down south to the town of Eastbourne and the chalk cliffs. We spent two days on our own hiking up and down Beechy Head and Birling Gap where we found that we could take vista photos of those amazing scalloped white cliffs, as well as get up close and personal when the tide was out. Having spent so many times in the last five years watching documentaries about the cliffs, reading books and histories about them it was kind of emotional to actually be there. I can see what the Romans saw from their boats – a white cusp of eternity, an alabaster form of inviting riches. They are huge and very, very white. We talked about the many iconic films and stories we remembered about the cliffs, Graham Greene, Quadrophenia and of course, WWII. In fact they practiced storming the beaches at Briling Gap. It was hard to imagine guns and canons going off over such a pristine place. But there you have England in a nut shell; a land that is part of the most important events in Western history. It is geology and culture at once. And the place really fits into our ongoing thesis about landscape. Needless to say we took a load of pictures. After Eastbourne we spent a day in London again, this time at the Tate Modern. After checking our bags at the train station we strolled down to St. Pauls Cathedral which is in a financial area so lots of suits and stilettos abound. The church is considered Wren’s masterpiece and it is amazing. I had never been there before. The grounds were packed with people on lunch eating and sunning themselves. Gary brilliantly pleaded ‘poor starving artist’ and we got in for free, thank god, it was 16 pounds!! More than Westminster Abbey. It is really nice in there and Gary walked me down the middle so I could pretend to feel what Diana felt – although quite frankly I could give a toss about what Diana felt. But it was kinda’ funny all the same. The crypts are very interesting and British Naval legend Nelson is the star. I kept thinking how my brother Andy was turning green with envy – Nelson’s crypt wasted on me!! We then walked to the Tate through the clever and lovely urban planned walk way over the Millennium Bridge. Great, great bridge and lots of vistas of London. The Tate is what you would expect, huge and full of great stuff. They were installing in the famous turbine hall but I wasn’t disappointed since I am not a fan of airport hanger galleries. The collection in the gallery is great and they have a Rothko room you could die in, literally. Dim lighting, his haunting work played out elegantly around you – it is pretty close to actually stepping into the concept of mortality. Senses overload on so many levels!!! They also have some really wonderful Joseph Beuys pieces – so it was a trip worth taking. At the end of the day we traveled to the east coast and the lovely town of Maldon. On the train we past the Olympic site full of a thousand cranes and gigantic so and so things. Maldon, as it so happens is famous for a pre-medieval battle with Vikings. Again my brother Andy must have been gritting his teeth knowing that that fact was wasted on me. I like Vikings as much as the next guy but I didn’t spend the first twenty five years of life obsessed with them like he did. Gary’s family were lovely and took us to the coast where I got to see how those weary Londoners spent their weekends, on boats and in pubs by the sea. It was very idyllic actually. Our last item of note was a church that dated back to 652AD, the oldest of its kind in the country. In fact it was built from left over Roman stones; a very interesting, solemn, peaceful and a truly sublime way to end our trip. As I write we are barreling along through the northern countryside of England toward London. We have just spent two weeks at an arts residence in Wakefield researching places of interest and landscapes that will help us create work based on our chalk and coal thesis; that England, like many places, has evolved culturally from geologic formations and vice versa. We came here a few thousand dollars short even though we raised a good sum from many private and public sources, but England is still pricey and our 20 pound a day budget is very hard to keep to. We have spent our time here being chauffeured around to many interesting places and landscapes by a fantastic group of well educated, art loving intellectuals and artists who were in some way connected with the coal mines. The recovered land around Wakefield is quickly hiding a three hundred year coal mining tradition which was prematurely closed overnight by none other than Margaret Thatcher in the mid eighties. In the past twenty years the West Yorkshire area and its residents have had to completely redefine who they are and what they should do. Almost everyone we met was deeply affected by the closers because that is all their families did for generations. This is a noble community full of feisty intelligence, rebellious and entrepreneurial spirit and yet there is a definite sadness – and yet there is great art! Henry Moore was born in the area and he is a great hero here since he was working class and his dad a miner. We visited his school, home and various local works scattered around. There was also a powerful retrospective on in Leeds which featured his fantastic Underground and mining drawings. While we were here the Hepworth Wakefield (Barbara Hepworth was famed local sculptor who is best known for working out of Cornwall) Gallery opened. This was considered extraordinary since England is suffering terribly from the recession and is experiencing austerity cuts that would make us in Canada squirm. It had a troubled time getting open since the people here seemed ambivalent. But we were lucky enough to attend a wonderful opening night party and go a few days later. Small but lovely, we think ‘The Hepworth’ has real potential. The landscape around Wakefield is gorgeous with famous Yorkshire red brick buildings, medieval architecture (apparently Cromwell attacked the Pontefract Castle), and dales and moors. We loved it. And the disappearing coal mines also made for that unusual sense of ‘the land that time forgot’. Evocative and inspiring, we are going home with loads of information for artwork. But we would have to say the best aspect of our trip so far has been the people. The great night we had in London with pal Lancton in Notting Hill and our Yorkshire hosts, Brian, Bob, Anne & Cameron, Lisa, Harry, Lorna, David the people at the National Coal Mining museum and all the other wonderful people around Wakefield who make it a very special place. It is an amazing community full of resilience and dignity (with the exception of young local girls who spent most nights imitating The Jersey Shore outside our residence window?!?!). And, they have invited us back for an exhibition and possible national tour!! 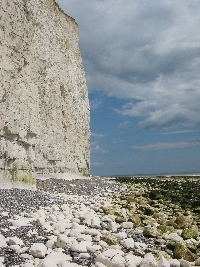 The trip so far has gone beyond our expectations and we are only now heading to the chalk cliffs to complete our research. We are looking forward to the channel, the cliffs and long meandering hiking… and apparently the best fish and chips in England.